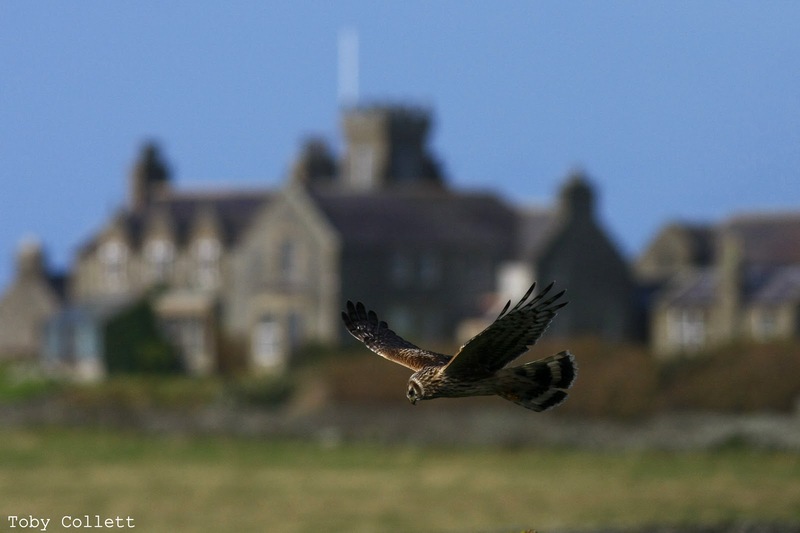 Ornithological staff will be off the island until mid-January, but we are taking bookings for the 2013 season NOW. We recommend booking your place at the Observatory early to enjoy North Ronaldsay birding at its very best and to avoid disappointment. See the website links above for rates or call 01857 633200 or e.mail alison@nrbo.prestel.co.uk for any enquiries. 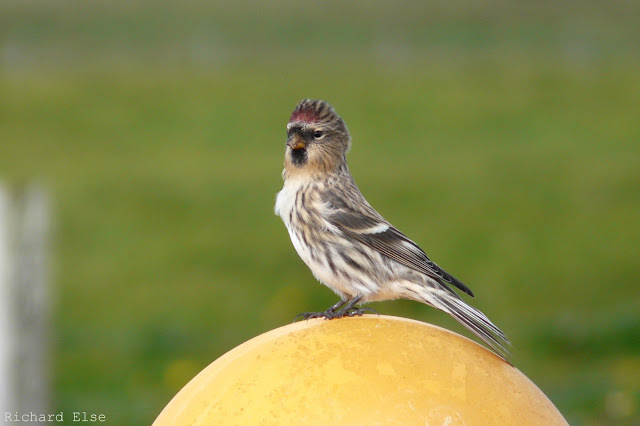 We look forward to seeing you in a bird filled 2013! Nothing to report from a wet 3rd, but the following day was dry, with a crisp wintry feel to it. A mobile Waxwing was seen in several places around the Island, and one of the juvenile Glaucous Gulls was at the north end. 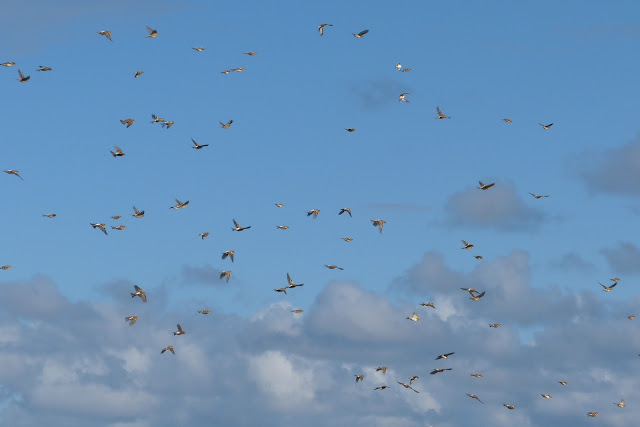 The colder weather brought an influx of Twite with the 78 near Kirbest the largest single flock of the winter so far, while smaller numbers were still in the observatory crops where there was also a single Snow Bunting. A drive around the Island to count the wildfowl saw 163 Wigeons, 82 Teals, 19 Pintails, 12 Shovelers, 17 Tufted Ducks, 6 Gadwalls, and 4 Goldenyes logged, and there were now 5 Whooper Swans on Bewan. Much the same as in the last post with little change in the wildfowl and wader numbers seemingly wintering on the Island. Presumably the same 2 juvenile Glaucous Gulls were seen again at the south end on 1st, and the same Pink-footed Goose lingered with the Greylags throughout. 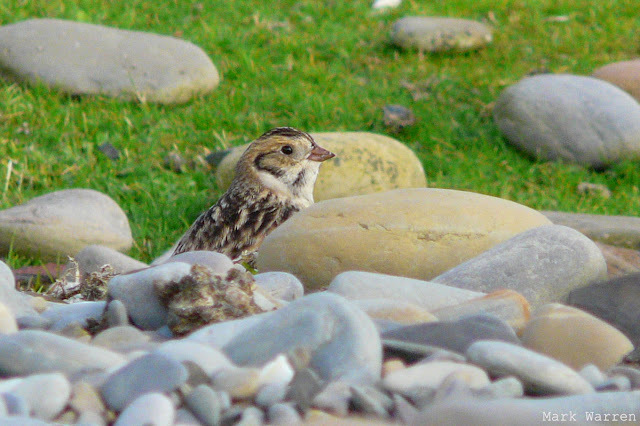 Twite and Snow Buntings were recorded daily with 36 of the former and 14 of the latter the highest counts, both within sight from the observatory on 2nd. Singles of Hen Harrier and Merlin were also seen and the 2 Whooper Swans were still present. Waxwings increased to at least 6 birds but there was still not a lot of movement from other species. A Whooper Swan on Gretchen Loch was new, a Goldfinch was at the observatory and Holland House garden contained 2 Woodcocks, 2 Song Thrushes and a Chiffchaff. 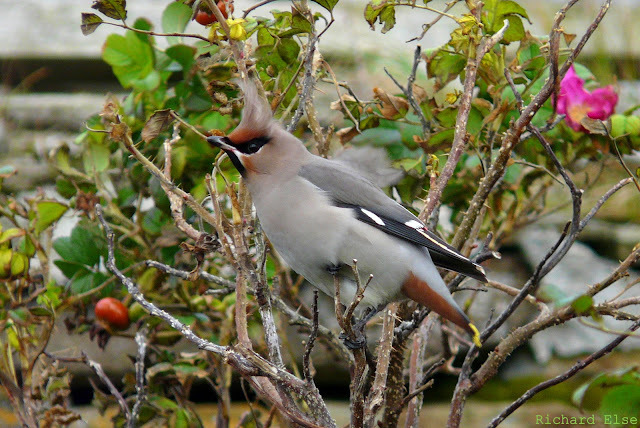 At least a couple of Waxwings were seen at Holland House in the morning. 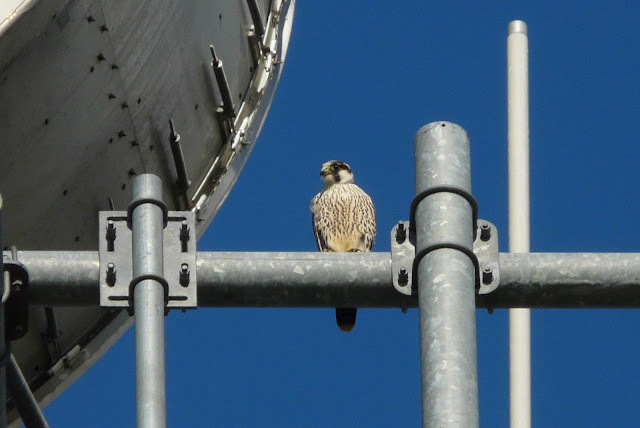 A Peregrine, a Song Thrush and a Robin were the best of the other new migrants and the American Golden Plover was back in the fields near the observatory. The rose hips at Holland House garden provide an attractive source of food in an environment devoid of supermarket car parks, fast food outlets and other optimum Waxwing feeding habitat. A good passage of Kittiwakes past the seawatching hide totalled 1,357 birds in 3 hours of recording, while other highlights from the session were 6 Little Auks, a Pomarine Skua, 3 Common Scoters and 7 Sooty Shearwaters. 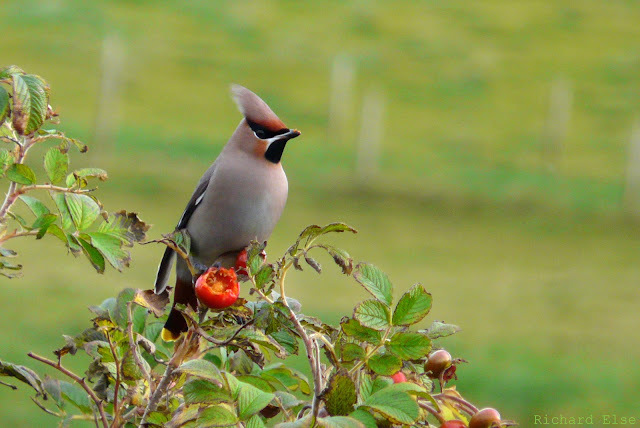 On land, a Waxwing at the observatory was the only really notable sighting. A couple of cold days produced little of note between the frequent hail showers. A couple of Sooty Shearwaters past the seawatching were the highlight of the 26th. The 27th had spells of less unpleasant weather but few birds. 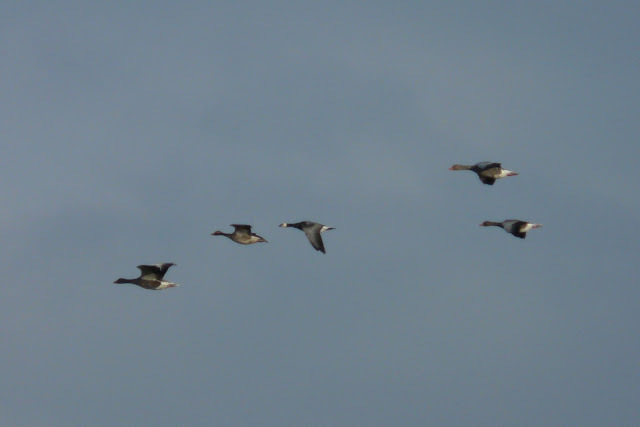 A Goldfinch and 3 Bramblings were around Kirbist, the flock of Greylag Geese still contained a Barnacle Goose and a Pink-footed Goose, and the American Golden Plover was still present. Cold with a blusterly north wind, the general absence of migrants and chilly conditions heralded the impending onset of winter. 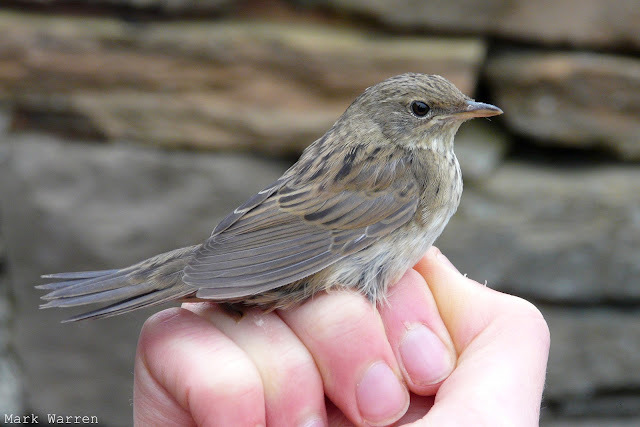 A Ring Ouzel and a Garden Warbler were the best new migrants as the majority of other thrushes and warblers departed. 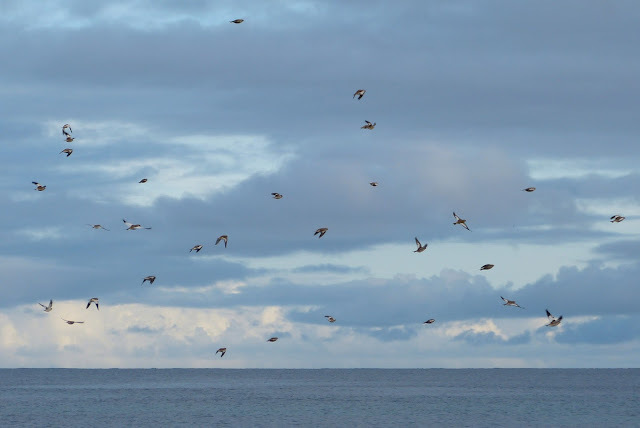 News of mega migrants from the east on nearby islands inspired a little extra hope on the census rounds, but there was really very little to live up to expectations. 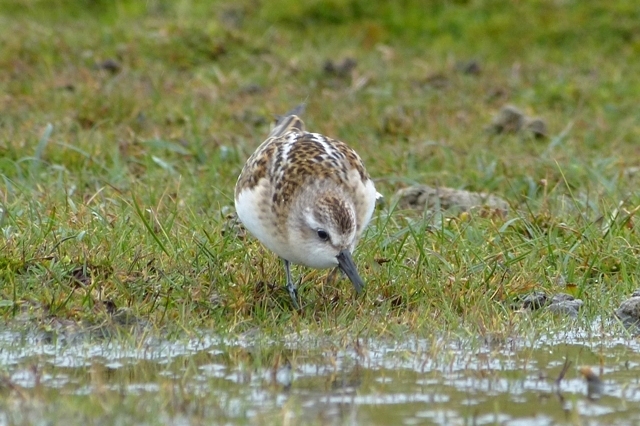 A Crossbill and a late Great Skua were just about the only new birds of note, while a Goldfinch and the American Golden Plover were the only noteworthy birds remaining from earlier days. The first live Waxwing of the year was perhaps the highlight of a generally quiet day, although notable lingering birds still included the Olive-backed Pipit, a Yellow-browed Warbler and the ever-present American Golden Plover. 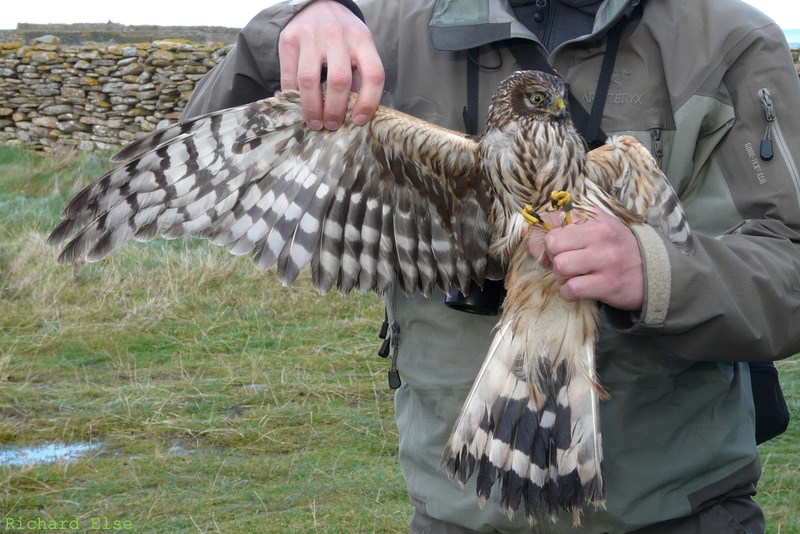 Commoner migrants were still scattered around: thrush counts came to 89 Fieldfares, 87 Redwings, 49 Blackbirds and 11 Song Thrushes; other passerines included a Goldfinch, 5 Goldcrests, 3 Chiffchaffs and 3 Blackaps; and 2 Hen Harriers, a Merlin and a Peregrine were the day's raptors. A day of topsy-turvy weather went from spectacular early morning blankets of low-lying radiation fog to cloudless, hot T-shirt-only conditions before lunch - and then reverted to fog again for the afternoon. 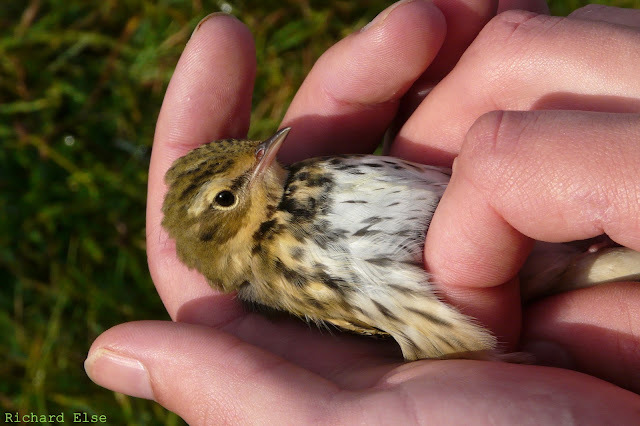 A small number of new birds included the year's second Olive-backed Pipit, which was found in a mist net at Holland House. 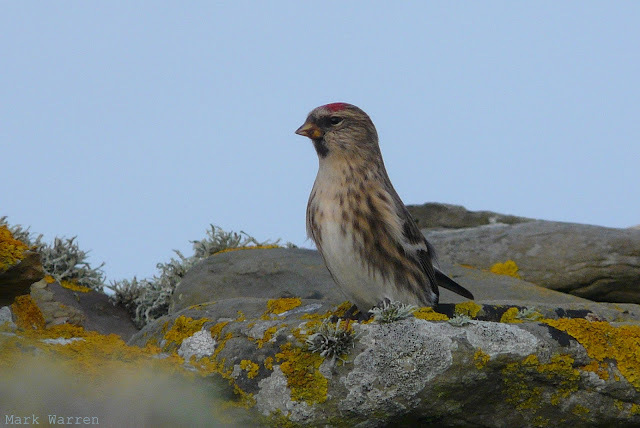 A couple of Arctic Redpolls were present: the usual ringed bird was still in the company of a group of Twites and a different lone bird was at Senness. 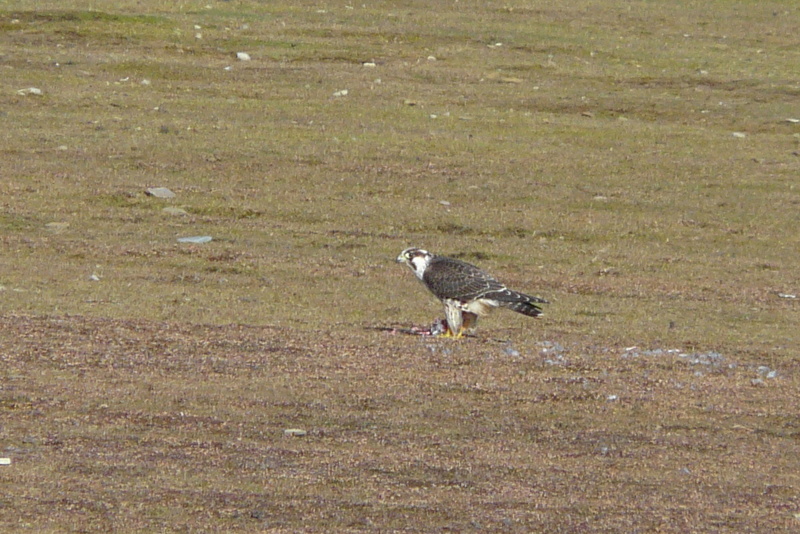 The latter bird appears to be another new individual. Other sightings included a Woodcock, a Lesser Whitethroat, 4 Blackcaps, a Lapland Bunting and a North-Western Redpoll. A lot of thrushes and other migrants had cleared out, but reasonable numbers still remained. Notable passerines included a new Yellow-browed Warbler at Westness, a Crossbill, 3 Lapland Buntings, 2 Greenfinches, 50 Bramblings, a Ring Ouzel, 4 North-Western Redpolls and the same Arctic Redpoll. The American Golden plover was still with the Golden Plovers near the surgery. 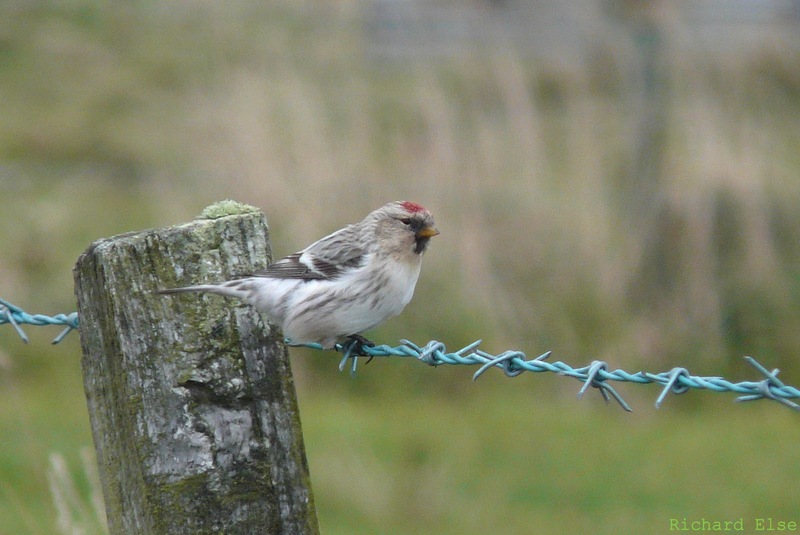 Another Hornemanni Arctic Redpoll picture - but we'll never tire of seeing these birds up close. In the hand, this individual can be identified as a first-winter male. And, from the opposite end of the Dulux redpoll chart, this large and dingy North-Western specimen is probably a Greenlandic Rostrata bird. A decent arrival dominated by thrushes also included a variety of other species. The pick of the bunch was the autumn's second Red-breasted Flycatcher seen from the observatory windows as it flitted around the patio in the afternoon. 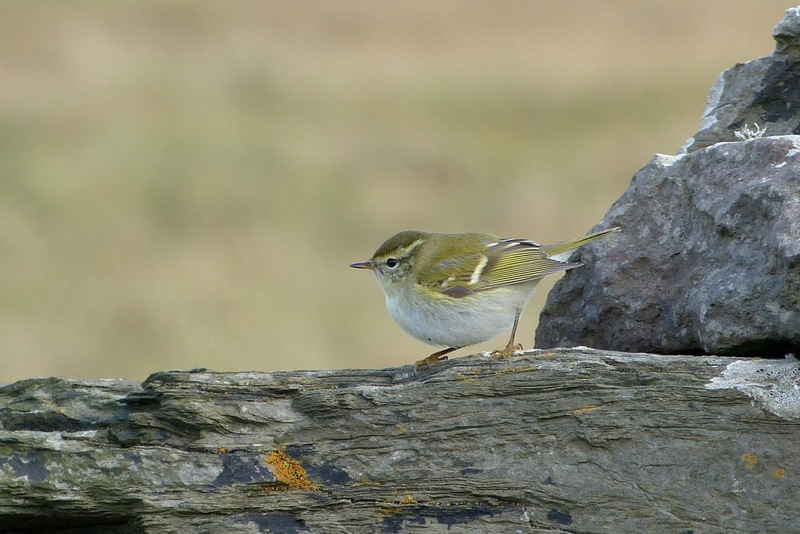 The first Yellow-browed Warbler for more than a week and a Crossbill were the other highlights, while the American Golden Plover and the (first) Arctic Redpoll were lingering rarities. 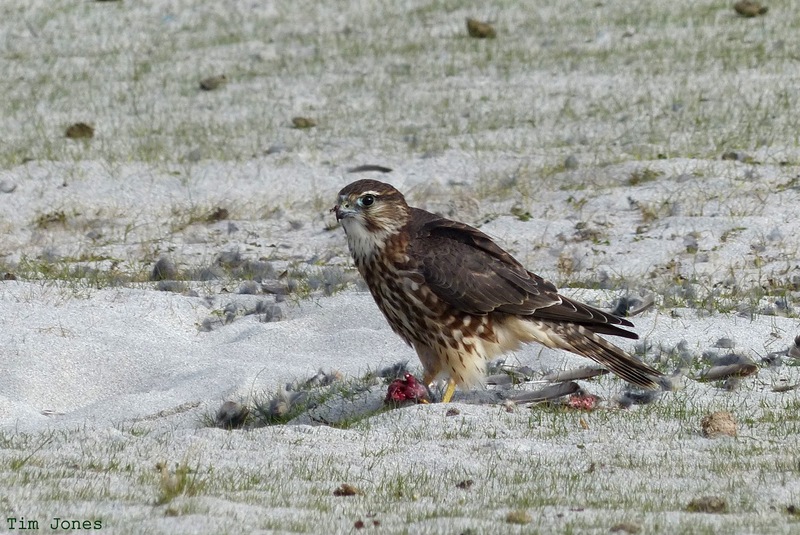 Much increased numbers of Fieldfares and Redwings were seen in the morning before many of them departed later in the day; 3 Ring Ouzels were also seen and other species arriving in numbers included 20 Lapland Buntings, 80 Snow Buntings and 67 Bramblings. 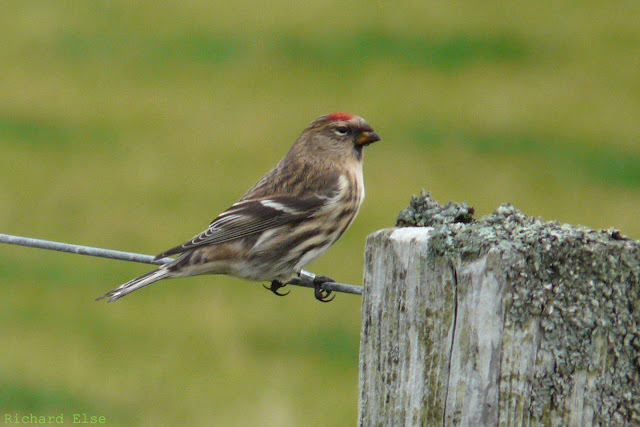 Redpolls provided most of the day's highlights. The Hornemann's Arctic Redpoll was back at Holland House in the morning and 5 Mealy Common Redpolls were seen during the day. 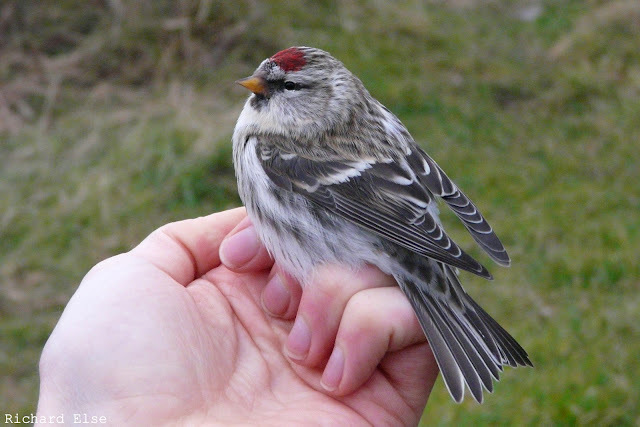 When a Hornemann's Arctic Redpoll was found in the yard at Holland House in the evening it was a surprise to see that it was clearly a different, less heavily streaked bird to the lingering individual. An exanimate addition to the year-list came in the form of a Waxwing that was found after it collided fatally with the surgery window. The only other notable species seen were a Goldfinch, a Peregrine, 2 Hen Harriers and the long-staying Black Redstart. 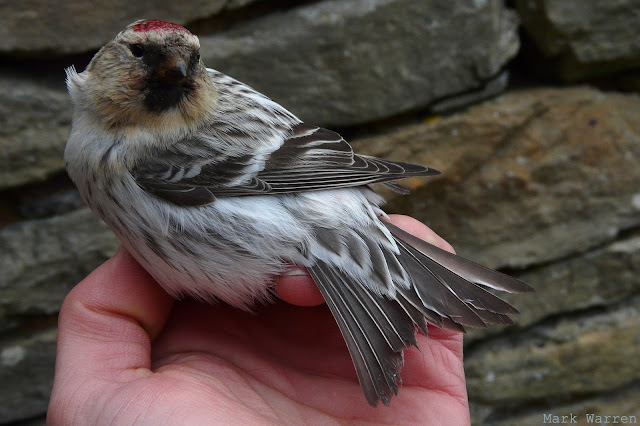 The new Arctic Redpoll was a particularly fine specimen. 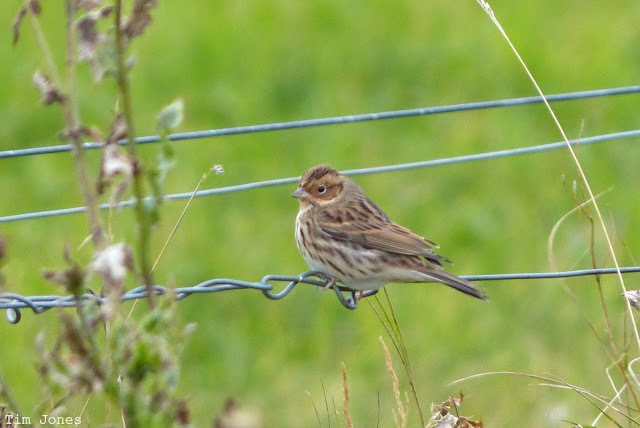 A similar selection of birds remained, with the Arctic Redpoll and the Little Bunting both still showing well in the Kirbist area and the Slavonian Grebe reappearing in Linklet Bay. 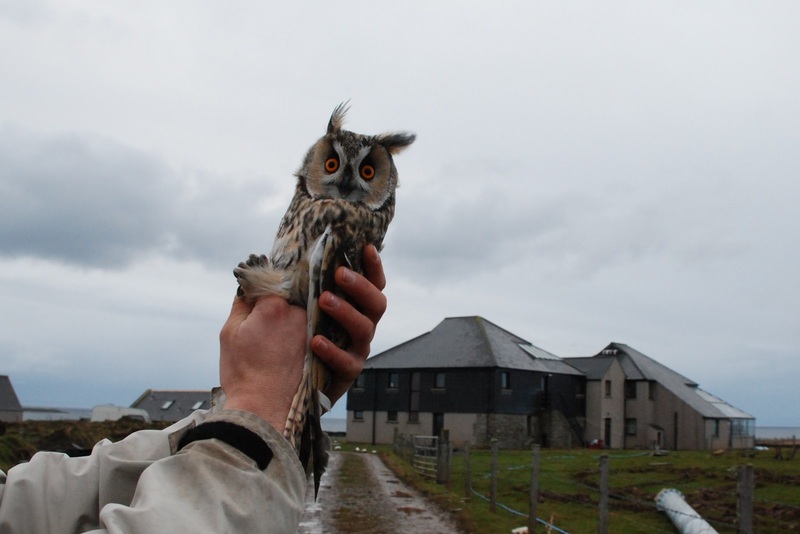 A Long-eared Owl at Cott was probably a fresh migrant but other newcomers were thin on the ground. Thrushes numbered 4 Ring Ouzels, 100 Blackbirds, 12 Fieldfares, 87 Song Thrushes and 342 Redwings; warblers were represented by a single Garden Warbler, 3 Blackcaps, 4 Chiffchaffs and 23 Goldcrests; and finches included a Mealy Redpoll, 7 Chaffinches and 89 Bramblings. 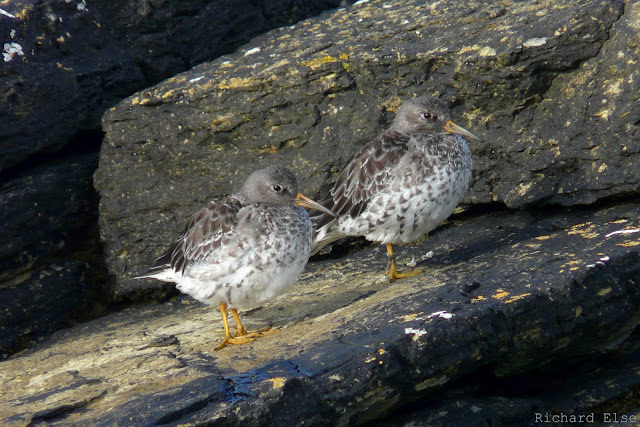 In continuing calm conditions, new birds, though low in quantity, were certainly high in quality. 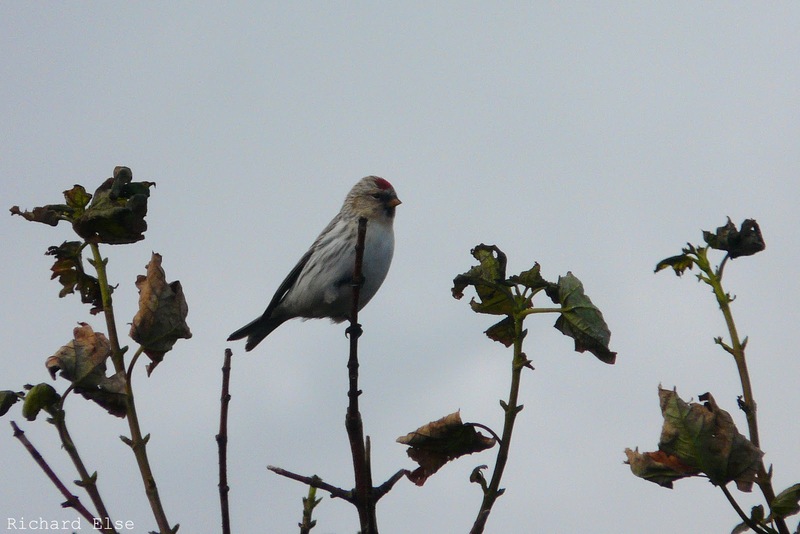 The morning's mist-netting session was just coming to an end when a Hornemann's Arctic Redpoll dropped into the top of the Holland House sycamores. 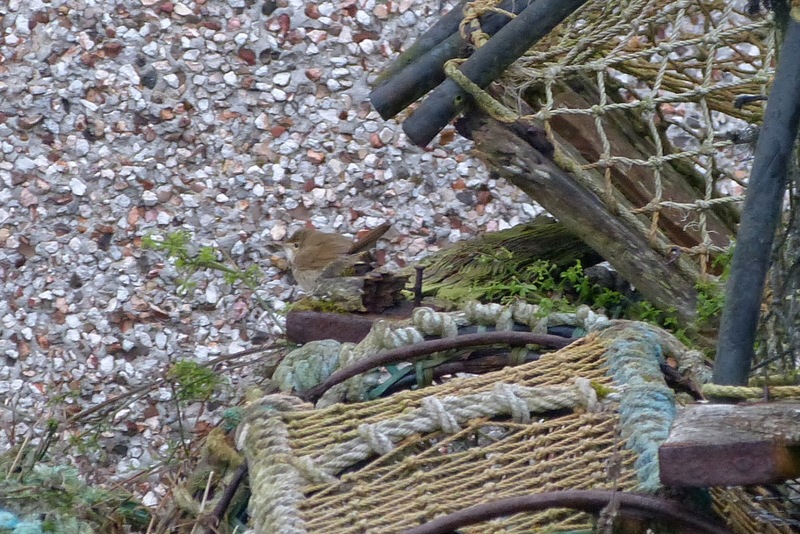 After evading the nets for a short time, it joined a group of Linnets and eventually found its way to the throngs of feeding finches at Kirbist where it spent the rest of the day. Early in the afternoon a Locustella was disturbed from the roadside ditch near the old mill. It was easily ushered into a hastily erected mist-net and confirmed as North Ronaldsay's fourth ever Lanceolated Warbler, arriving less than a month after the third. 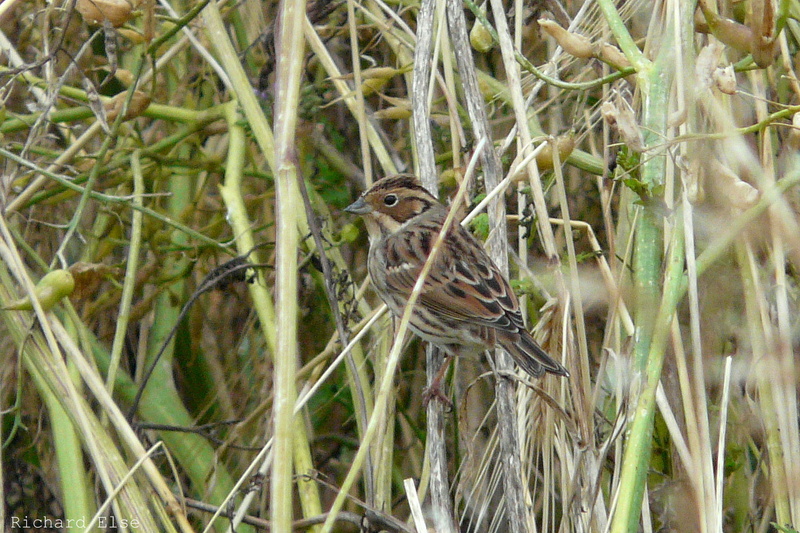 The Little Bunting and the American Golden Plover completed the day's rarity line-up. 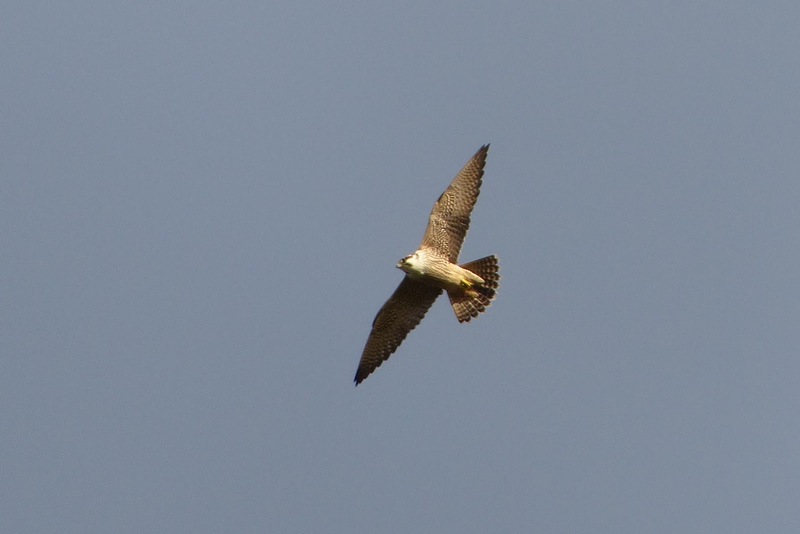 Other sightings included the first Long-eared Owl of the autumn, a late House Martin, a Ring Ouzel, a Mistle Thrush and 4 Greenfinches. A similar selection of birds was seen during a day of near-perfect calm conditions. The Little Bunting was seen again in the crop fields at Kirbist where it was in the lively company of 140 Bramblings and an assortment of other finches. Goldcrests were scattered all over the island, with 71 counted on census, and a noticeable influx of Rock Pipits took their total to 32; less numerous songbird species included 2 Ring Ouzels, all the commoner thrushes in fairly static quantity, 15 Robins, 2 Wheatears, 3 Dunnocks, 3 Blackcaps, 2 Chiffchaffs, 1 Swallow, 3 Greenfinches, 3 Siskins, 11 Chaffinches and 5 Redpolls (the latter including at least 1 North-Western bird and a Mealy). 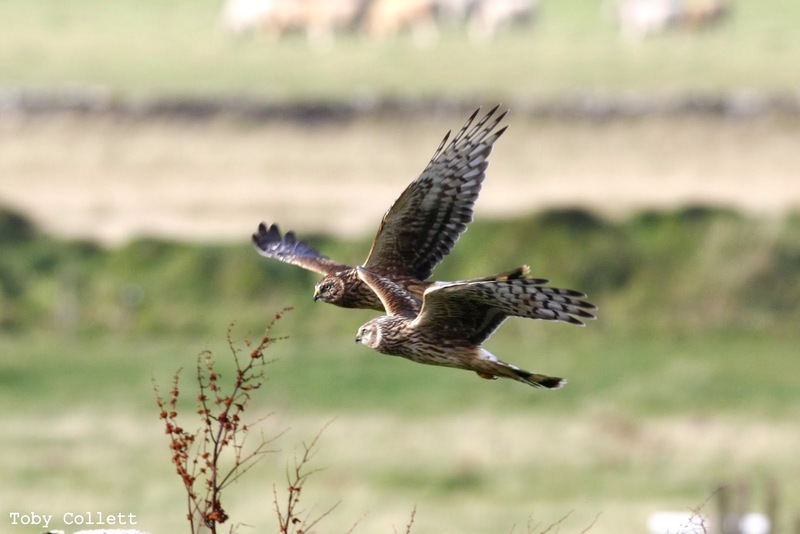 The 2 Common Scoters and the American Golden Plover were still around, a Hen Harrier and a Short-eared Owl were new birds of prey and a couple of Woodcocks were seen. 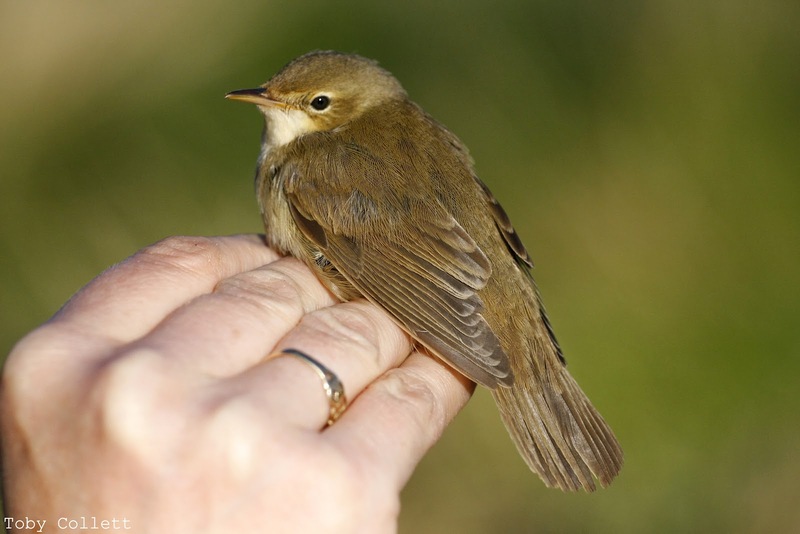 Plenty of migrants still remained although numbers, particularly of thrushes, were dwindling and immigration was slow. A single Swallow and a Wheatear were lagging behind the rest of their respective kinds, the Yellowhammer and the Whitethroat were both still present and counts of other migrants included 142 Bramblings, 12 Chaffinches, 34 Goldcrests, 1 Chiffchaff, 4 Blackcaps, 9 Robins, 2 Dunnocks, 1 Mealy Redpoll and 1 North-Western Redpoll. 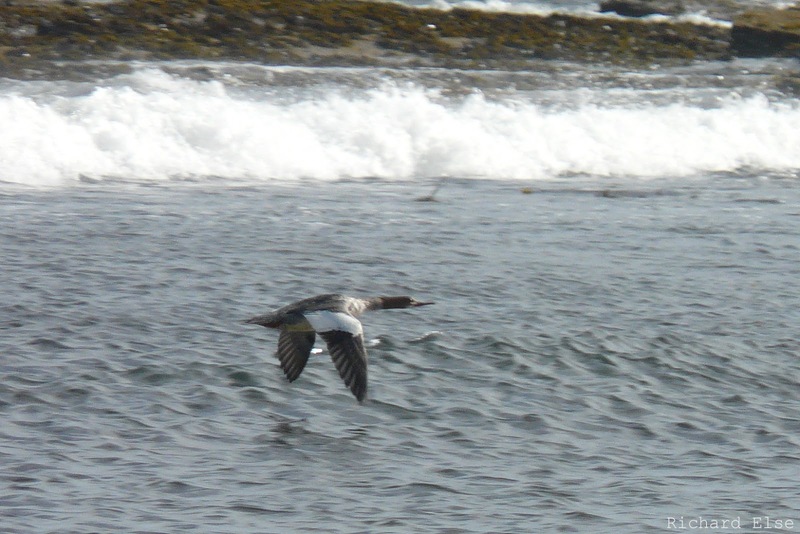 A couple of Common Scoters were on Gretchen Loch, a Barnacle Goose was seen and the American Golden Plover was still in the middle of the island. A very pleasant day had plenty of migrant interest and a good window of mist-netting weather. 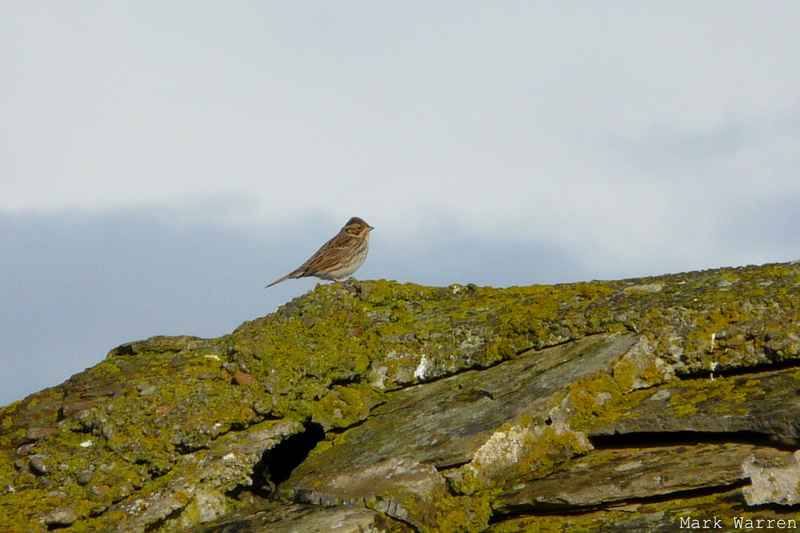 The day's highlights were a new Little Bunting and a Yellowhammer at Kirbist and a Slavonian Grebe in Linklet Bay. Thrush numbers were generally diminished, with counts dropping to 343 Redwings, 102 Blackbirds, 77 Song Thrushes, 14 Fieldfares and 3 Ring Ouzels, but Goldcrests increased to 77 and Bramblings to an impressive 218 birds. 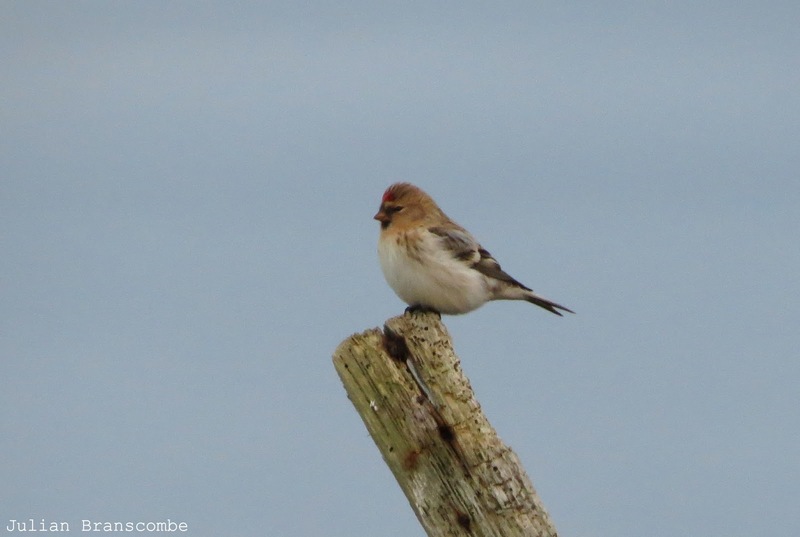 A variety of other noteworthy passerines included a Tree Pipit, a Redstart, a Whitethroat, 2 North-Western Redpolls, a (Mealy) Common Redpoll, 2 Goldfinches, 4 Siskins and 4 Lapland Buntings. 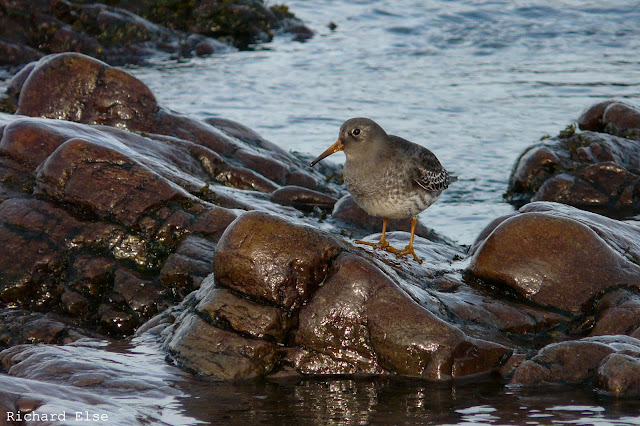 The first Common Scoter for several months was in Nouster Bay, 6 Woodcocks were seen and 8 Jack Snipe were flushed from boggy areas at Kirbist and Ancum. The excellent Brambling total included a spectacular flock of around 130 birds in the crop field at Kirbist. Another good day saw migrants continuing to flood in on the strong easterlies, although the species composition was slightly different: Redwing numbers dropped noticeably to around 750, while Blackbirds increased to 260, Song Thrushes to 110 and Bramblings to 179. The bird of the day, joining the year-list much later than expected, was a Grey Wagtail on the west coast; a variety of other small migrants included 2 Goldfinches, a Siskin, 8 Chaffinches, 24 Goldcrests, 1 Willow Warbler, 1 Chiffchaff, 3 Blackcaps, 17 Fieldfares, 5 Ring Ouzels, 11 Robins and a Dunnock. A total of 8 Woodcocks included a bird caught in the observatory Heligoland traps which also unexpectedly trapped a Jack Snipe during the morning. At least 9 Barnacle Geese, 3 Woodpigeons, 2 Short-eared Owls and a late Whimbrel arrived and the American Golden Plover remained as usual. The strong easterly winds continued and many more birds arrived during the day. The best of the new arrivals were both at the Observatory early in the morning. 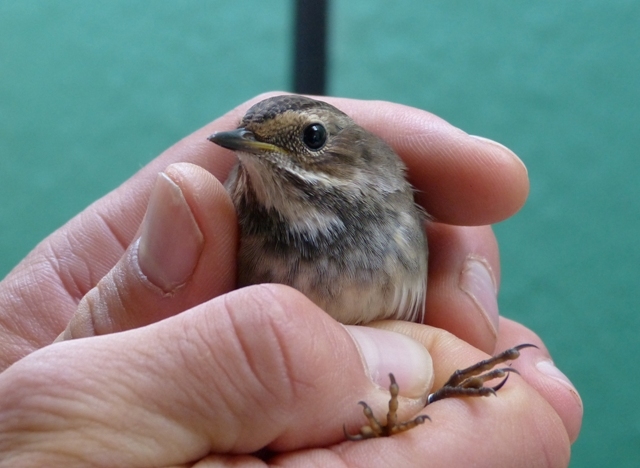 The first was a Bluethroat trapped in the newest Heligoland Trap, with another still at Kirbest for its second day. Shortly afterwards a mobile Olive-backed Pipit was found in the same area, although it promptly vanished after giving everyone the run-around for an hour. Other highlights included the first Glaucous Gull of the autumn off Torness and also the first 3 Woodcocks. Redwings again dominated with at least 1016 present while other counts of Thrushes came to 57 Blackbirds, 44 Song Thrushes, 3 Ring Ouzels, 5 Fieldfares and a Mistle Thrush. Also seen today were a Jack Snipe, a Dunnock, 7 Robins, 3 Blackcaps, 4 Chiffchaffs, 27 Goldcrests, 2 Chaffinches and 3 Siskins. A touch of east in the wind produced an immediate fall of migrants. As might be expected for the time of year, the vast majority were Redwings, with 668 counted descending upon the Twingness croft in the morning. The year-list finally crept over the 200 mark courtesy of 2 Bluethroats seen on morning census, and other notable species were a Barred Warbler and 2 Yellow-browed Warblers. The day's other migrants included 8 Song Thrushes, a Lesser Whitethroat, a Chiffchaff, a Willow Warbler, 2 Chaffinches, 9 Bramblings, 3 Goldfinches and 6 Lapland Buntings. There was no sign of the Blyth's Reed Warbler in the morning, but a small number of new birds did seem to have arrived as the wind dropped, backing towards the south-east in the evening. A couple of Lesser Whitethroats, a Garden Warbler and 2 Blackcaps were the only warblers, while a Fieldfare, 6 Redwings, 4 Goldfinches and 10 Lapland Buntings were probably fresh in. The Black Redstart and the Hawfinch were still present, as was the usual American Golden Plover. The first 4 Long-tailed Ducks of the autumn were seen in Linklet Bay and passage seabirds included 375 Fulmars (including a blue one), 18 Sooty Shearwaters, a Manx Shearwater and 500 Kittiwakes. 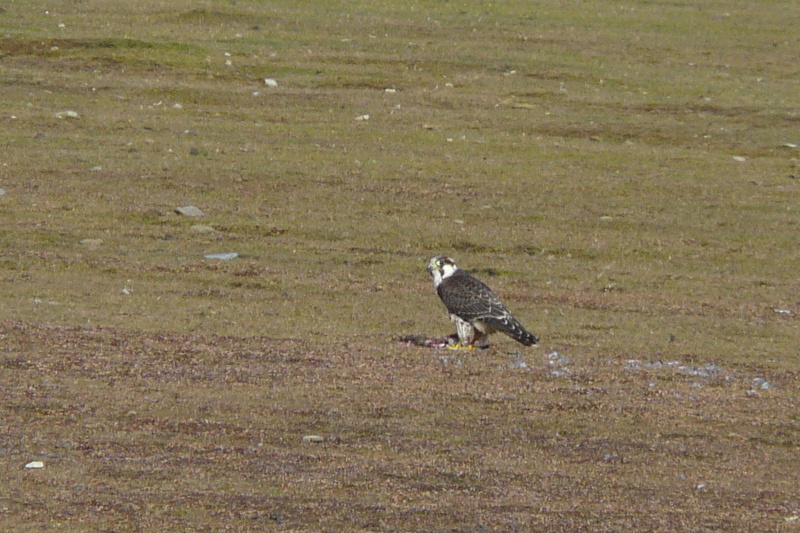 The day's raptors were 3 Hen Harriers, 3 Merlins and a Peregrine. Plenty of Snow Buntings have been around lately, with counts exceeding 200 birds on some days. Just about the only new small passerine migrant of the day turned out to be the rarest for a while. 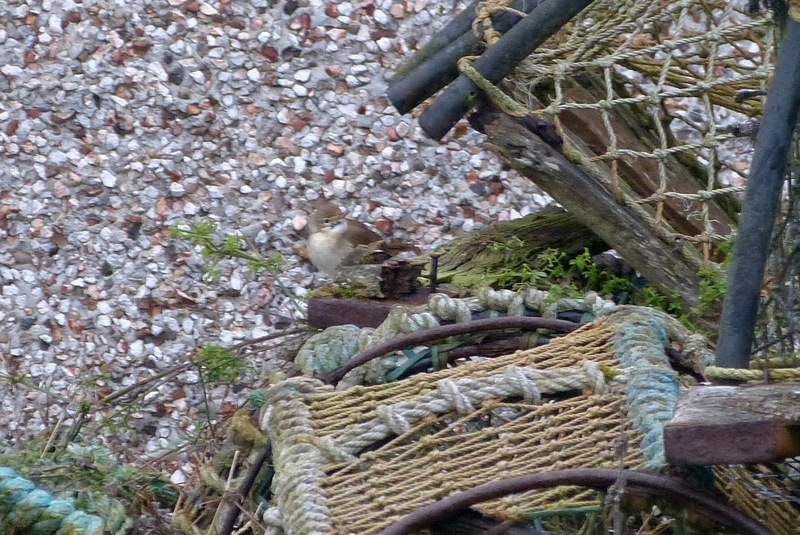 A tricky warbler flitting between piles of lobster pots and patches of canary grass at Vincoin was seen well enough to confirm its identification as NRBO's 12th Blyth's Reed Warbler. 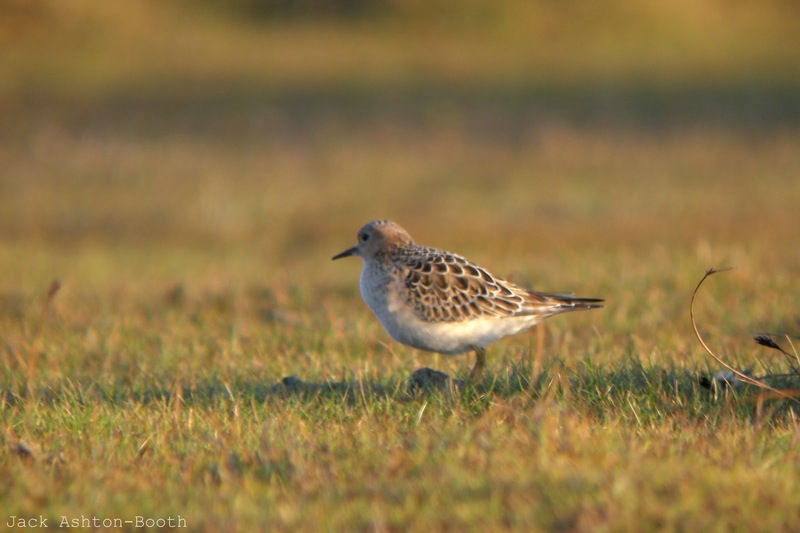 This is a new species for the year, but there were two records in both 2010 and 2011. 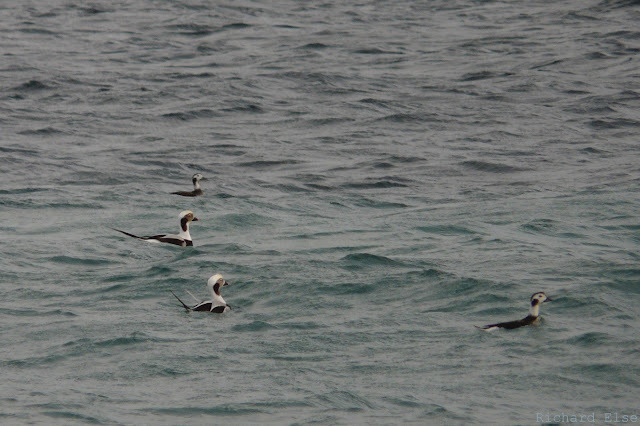 A decent passage of seabirds comprised 1,720 Fulmars (including 3 blue-phase birds), 33 Sooty Shearwaters, 1 Manx Shearwater, 691 Kittiwakes, 9 Little Auks, a Pomarine Skua and a Goldeneye. 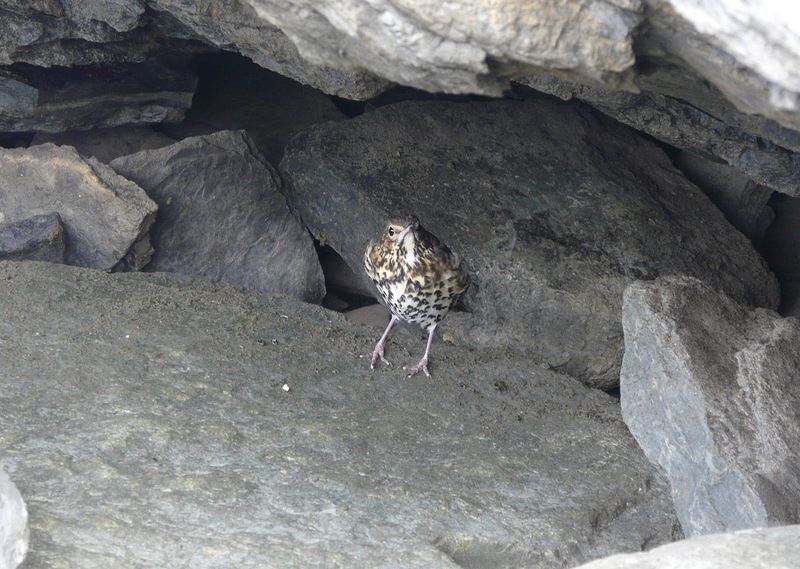 At least 25 Ravens toured the island during the morning, 5 Whooper Swans were on Gretchen Loch, the Hawfinch and the American Golden Plover were still present and a couple of Song Thrushes were seen. A long-awaited Red-breasted Flycatcher, discovered in Holland House gardens late in the afternoon, was the welcome highlight of a windy and wintry day. 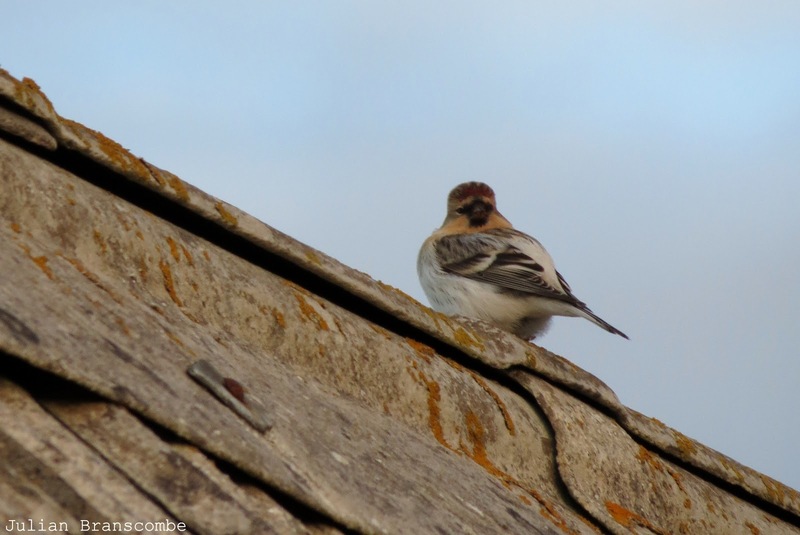 A flock of 11 Whooper Swans and 6 Redwings were just about the only other new migrants, but lingering birds included the Hawfinch, the Black Redstart, 2 Blackcaps and the American Golden Plover. More westerly winds meant a return to the drought of new migrants. There was nothing of note on the 6th, and the highlights of the 7th were 10 Goldfinches, a new Hen Harrier, a Fieldfare and a Redwing. 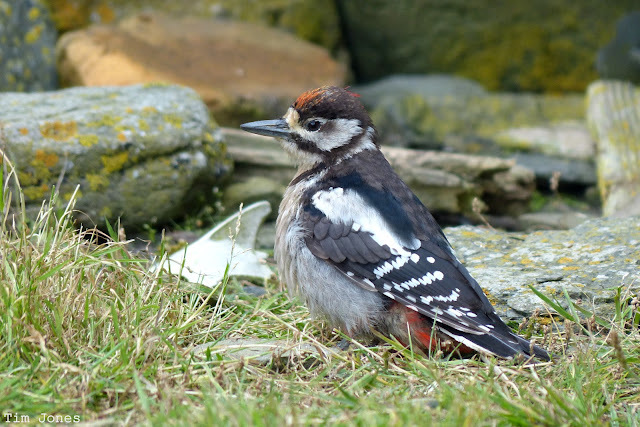 The Marsh Warbler and a long-staying Black Redstart were still present on the 6th; the Hawfinch and American Golden Plover remained for both days. A more eventful day was greatly enlivened by a couple of rarer migrants injecting some much-needed excitement into the daily census routine. A Rustic Bunting at Nether Linnay in the morning was a frustratingly brief highlight, immediately vanishing and evading detection during the intensive relocation efforts which ensued. 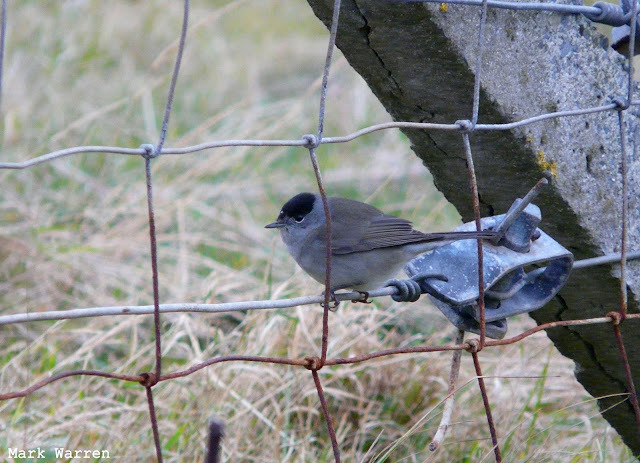 Rather less mobile was a very skulking warbler at Westness that was eventually ushered into a mist net and identified as the autumn's first Marsh Warbler. 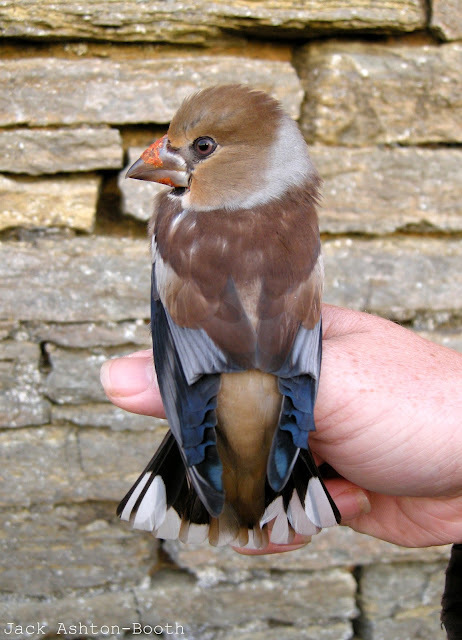 The Hawfinch was trapped and ringed at Holland House in the morning, while other small migrants included 3 North-Western Redpolls, a Greenfinch, a Yellow-browed Warbler, a Garden Warbler and 2 Swallows. 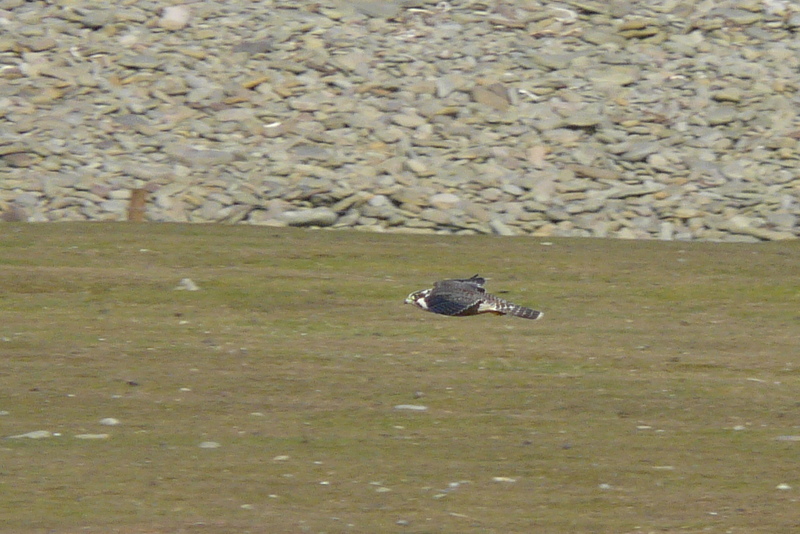 A couple of Hen Harriers, a Peregrine and 2 Merlins were seen and the usual American Golden Plover remained. 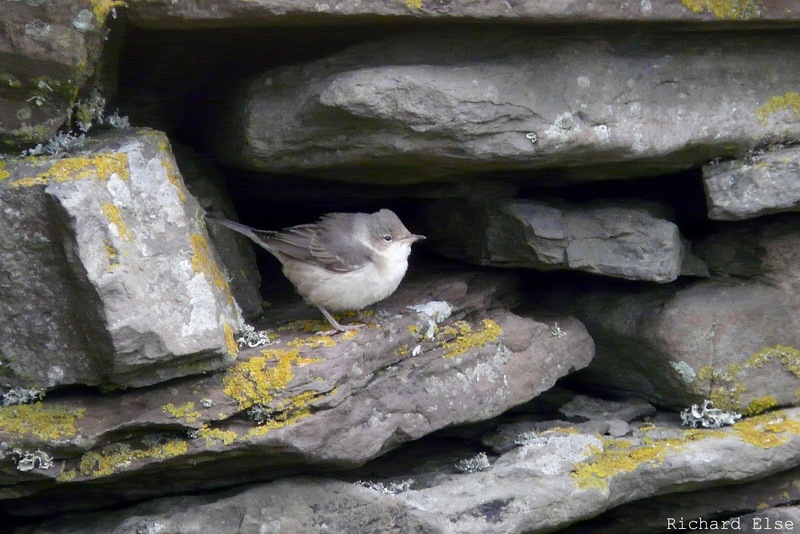 A similarly scanty selection of migrants had little new to offer. 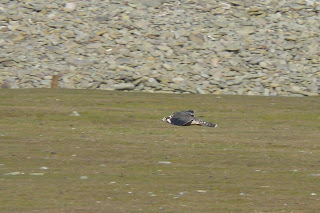 The American Golden Plover showed well as usual, a Peregrine and a couple of Merlins were the only raptors and a couple of North-Western Redpolls, a Chaffinch, a Whinchat and 4 Blackcaps were the passerine highlights. 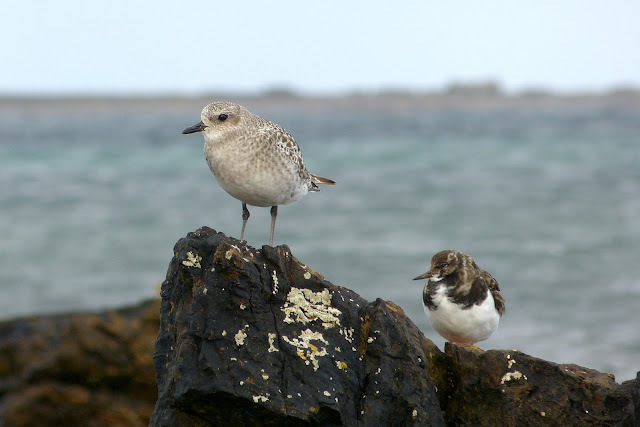 Grey Plovers are surprisingly infrequent visitors to North Ronaldsay. Just this one individual was present today. An even quieter day saw nothing more remarkable than 3 Goldfinches. 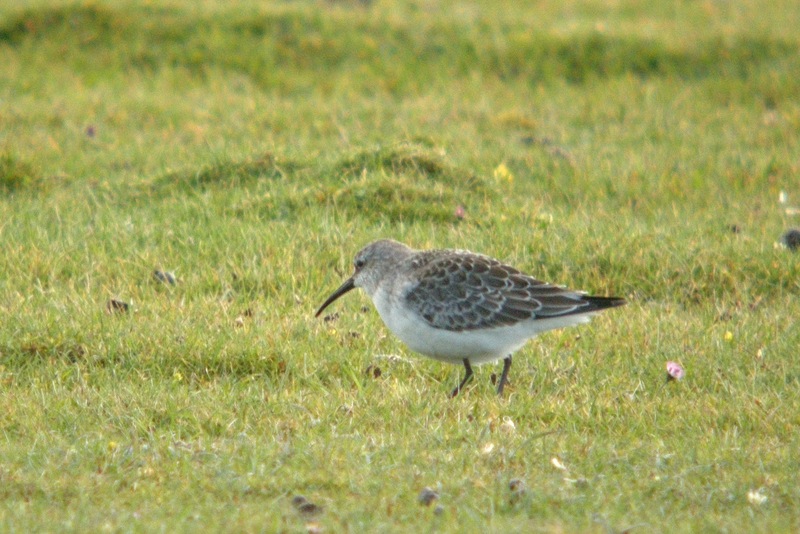 A Tree Pipit, 3 North-Western Redpolls and the long-staying American Golden Plover were also seen. There was still very little overall change, and 3 Crossbills were the most interesting sighting of the day. Other small birds included a Sand Martin, a House Martin, a Black Redstart, a Common Redstart, 2 Tree Pipits and 2 North-Western Redpolls. The Iceland Gull, an American Golden Plover, 4 Jack Snipes and a Short-eared Owl were on the island and 31 Whooper Swans and a Peregrine flew south. The arrival of October did not bring any immediate change in migrant numbers, just a handful of new birds joining the small collection of non-movers. The most notable of the new arrivals were 2 Sparrowhawks (a species that didn't feature at all during September), 2 Fieldfares, 3 House Martins and the first Iceland Gull of the autumn. 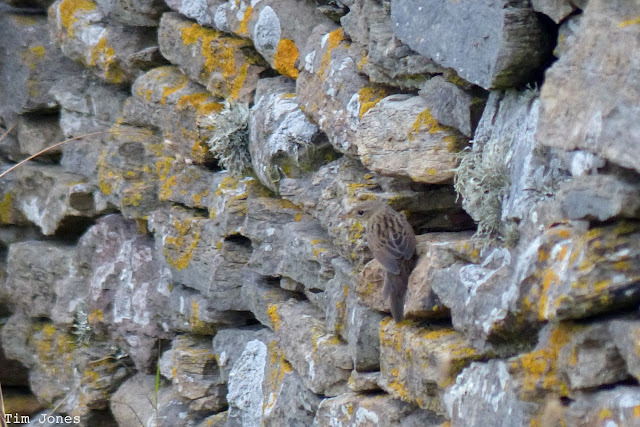 The Hawfinch and an American Golden Plover both remained; a count of 38 Rock Pipits was a notable increase; 19 Sooty Shearwaters passed the seawatching hide; and other species included a Redstart, 3 Willow Warblers, a Lesser Whitethroat, 2 Hen Harriers, 2 Merlins and a Kestrel.